^ Glossary of Meteorology. Hydrosphere. 互联网档案馆的存檔，存档日期2012-03-15. Retrieved on 27 June 2008. ^ Glossary of Meteorology. Troposphere. 互联网档案馆的存檔，存档日期2012-09-28. Retrieved on 27 June 2008. ^ Climate. Glossary of Meteorology. American Meteorological Society. [14 May 2008]. ^ [失效連結] Mistic House. Astrology Lessons, History, Prediction, Skeptics, and Astrology Compatibility. 互联网档案馆的存檔，存档日期2008-06-08. Retrieved on 12 January 2008. ^ Eric D. Craft. An Economic History of Weather Forecasting. 互联网档案馆的存檔，存档日期2007-05-03. Retrieved on 15 April 2007. ^ Mark Moore. Field Forecasting: A Short Summary. 互联网档案馆的存檔，存档日期2009-03-25. Retrieved on 25 May 2008. ^ Richard J. Pasch, Mike Fiorino, and Chris Landsea. 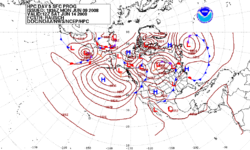 TPC/NHC’S REVIEW OF THE NCEP PRODUCTION SUITE FOR 2006. [永久失效連結] Retrieved on 5 May 2008. ^ National Weather Service. National Weather Service Mission Statement. 互联网档案馆的存檔，存档日期2013-11-24. Retrieved on 25 May 2008. ^ Blair Fannin. Dry weather conditions continue for Texas. 互联网档案馆的存檔，存档日期2009-07-03. Retrieved on 26 May 2008. ^ Dr. Terry Mader. Drought Corn Silage. 互联网档案馆的存檔，存档日期2011-10-05. Retrieved on 26 May 2008. ^ Kathryn C. Taylor. Peach Orchard Establishment and Young Tree Care. 互联网档案馆的存檔，存档日期2008-12-24. Retrieved on 26 May 2008. ^ Toronto Catholic Schools. The Seven Key Messages of the Energy Drill Program. 互联网档案馆的存檔，存档日期2012-02-17. Retrieved on 25 May 2008. ^ Rodney Viereck. Space Weather: What is it? How Will it Affect You? [永久失效連結] Retrieved on 28 June 2008.